The 100-hour* Ultrasonic Warm and Cool Mist Humidifier guards against problems caused by dry air in the home. It features an easy to fill large 1.5 gallon tank, ideal for use in medium sized rooms. Unlike other humidifiers that grow slimy mold on the water tank surface, Silver Clean? Protection is embedded in the tank to fight the growth of mold and mildew on the surface of the water tank. Thanks to ultrasonic technology, it disperses a fine mist into the air, and is ultra-quiet making it ideal to have on while you sleep. The humidifier?is equipped with the option for warm or cool mist, a night light and variable mist control. A low water indicator light lets you know when it's time to refill the water tank. PureGuardian? humidifiers create a better home environment for those suffering from colds, allergies and dry skin. Note: Run time is based off of running the unit on low speed, also depends on atmospheric conditions. Does exactly what it's suppose too and more. First, let me tell you that I receive the Pureguardian 100 hour ultrasonic humidifier to tell my honest opinion. From the time I heard about a humidifier and its benefits, I wanted one, but just didn't get around purchasing one. So when I first open the package, I was so excited to try the product, but didn't know exactly what to expect or let alone install it. I would honestly say it took about 2 minutes to install, keep in mind you can input 1.5 gallons of water, which depending on how long you have the unit on could last about 3 days or more. I have been using this product for over 2 weeks, and I am really impressed about the benefits, no more stuffy or running nose, I can breathe easily and stay healthy during winter months. There is no need to replace or purchase any filters. 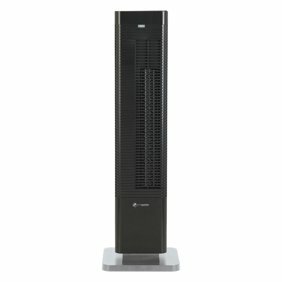 This unit is really quiet, so you don't have to worry about the sound while you are sleeping or doing the things you like to do. I also like the night light option, what's great about it is that it isn't too bright, this is an option that kids would really like. There is a control panel where you can control the amount of mist, you can choose cool or warm. It keeps away mold and mildew, which is a plus. If you have little kids or just want to buy an humidifier for yourself I would definitely recommend you buy this unit, it's easy to use, quiet, it does what it says, and comes with a 3 year limited warranty. I just received the Pureguardian Ultrasonic 100 Hour Humidifier. Our house usually has dry air in the summer and it is a lot worse in the winter especially when we use the gas heater. This humidifier works amazingly. Right out of the box, there is no assembly required. It is easy to fill with water as it has a very large opening. Just stick it under the faucet in your kitchen sink and fill it up. Replace the lid and secure it and place the water reservoir onto the base. It has 2 settings, cool mist and warm mist. You can also control the flow of the mist by a dial on the front of the unit. It also has dual humidity spout which allows the mist to flow in to different directions. This unit also has a soft night light which I find wonderful. It lights up the water reservoir, which is colored blue, with a soft glow. There is a light that will come on to indicate that it is low on water. This unit is very quiet. We have a small house and on full flow our house became kind of damp so I turned the unit off for a couple of days and began again on a lower setting. So if you have a small house, start low with the mist control. Tips: *Make sure it is set on a level, water resistant surface. *Make sure it is at least 6 inches away from the wall. *Do not use near any electrical appliances as it may damage your electronics. *Start out on lower setting first and adjust from there. *If you have hard water, you will want to use a softer water so you won't have film build up in your unit. I would definitely recommend this to anyone who needs a humidifier. This really is worth the money and it does a great job! Excellent Humidifier ... I Love It !! This little humidifier does a great job and has some nice features! There was no assembly required upon opening the box. The only thing I had to do was fill the water reservoir and cap it and it was ready for use! The design of this humidifier is sleek and modern looking. The machine is compact yet sturdy and I could easily set it up on my countertop or put it on the floor. The controls are simple to use and to figure out. The machine has a warm and cool mist setting which is definitely different from other models I've looked at. To be honest, I didn't notice a big difference in the temperature of the mist when I switched between the two settings and I'm really not sure why you would need this feature. It has a soothing cool blue night light feature which I felt was an awesome idea to add to the machine (and definitely nice if you are sneaking in to check on a sick child in the middle of the night!) The light is easily accessible by using the control knob located on the front of the machine. There is also a low water light on the machine which for me is a plus as it allows just a quick glance to see if the machine needs more water. The manufacturer included a small brush to clean the humidifier with as well. It snaps right into the machine for easy storage which is nice. It's one less thing you have to worry about misplacing. Finally, this humidifier is very quiet while in use. You would never even know it is operating and you forget it is there! Good humidifier with nice features. I like the looks of this unit, it is very fashionable. What I like the most about this is that it uses a silver clean technology to help stop mold and mildew from forming. It does not take a filter, which is another plus since there is nothing to replace. It is very light weight and very quiet, I almost can't hear it at all. I also like that the direction control for the mist is dual, so you can aim the mist in 2 different directions at the same time. This model does produce both cool or warm mist. On the warm setting it really doesn't get as warm as I expected. It operates with 3 dials on the front. The first dial is the on/off and also controls your mist between cool or warm. The second dial controls the amount of mist that comes out. It gradually adjusts from low to high for a more accurate control of your mist amount. The third dial turns your night light on and off. The night light gives off a very nice blue glow for sleeping. The red light low water indicator is also located right next to the third dial. It holds 1-1/2 gallons of water. It's cord is 5 ft long. It comes with it's own cleaning brush. It stands 11-1/2" tall. It is ideal for small to medium sized rooms. The only problem I have had is that for some reason every so often it will quit working, usually after I've refilled it or moved it around a lot while it's running. It will be full of water but not turn on and the low water level red light stays lit. I found if I use it's cleaning brush and clean around the disk and jiggle the float ring it will start working again. I've had to do this right out of the box so it's not because of a hard water build up on my part, so why exactly it does this I do not know. Out of 5 stars, I give this humidifier 4 stars! If it weren't for the problem I've had I would give it a 5. I needed to get a better humidifier for my son. He gets nose bleeds without one. Our old one just didn't last the entire night, and would start making horrible noises once it was empty. This one has an indicator light to warn when the water is low. The "100 Hour" estimate is about right. A full tank of water lasts almost four whole days. Although, I usually only run it at night, so it lasts nearly a week in between fillings. It has the option of either warm or cool mist, however, I can't really feel any difference. The price of this model seemed a bit steep for a humidifier. However, after taking into consideration that it doesn't require costly filters, the price isn't that bad. The last humidifier I purchased cost only a third of what this model costs, but it required a new filter every month, so it really ended up costing more. There is an optional cartridge (model FLTDC) that prevents the build-up of minerals. It costs about $15, but isn't necessary. However, the manufacturer recommends using it or buying distilled water. It holds about a gallon and a half of water, so in the long run, it may be cheaper to just get the cartridge. It utilizes something called "Silver Clean" technology to deter mold. The tank is a generous size and easy to fill and clean. It is a very quiet humidifier. It hasn't bothered my son's sleep at all. It is simple to program and use. I like that the direction of the mist can be controlled. I wanted to get a humidifier for a while now because we run an electric heater in our living room and we have a lot of hard wood in our house and I don't want it drying out and having issues! First off, it is very easy to fill and has a large opening so no worries about water running down the sides and having to wipe it off before you put it back on the base. We let it running for about 4 or 5 hours a night and can go quite some time before we have to refill it. Love the fact that it has the low water light and a directional steam outlet and that you can change the amount of the humidity as you want. The night light is also a nice feature even just for reminding you it's still on! Only drawback I can think of is the cord length, it really could stand to be a little longer. Unless you are putting it right next to or right above an electrical outlet, you'd probably need an extension cord. Overall, I would recommend this humidifier, nice size and run time on a tank of water, quiet, no water buildup on it, and soft blue night light is nice too. I have used many different humidifiers. This unit is really nice. It is the only unit I have ever seen that will switch from cool to warm mist. This feature really makes the unit unique. Another feature is, the amount of mist can be changed with the controls on the front. A very fine mist or a heavier, more visible mist can be used. Keep in mind this option will determine how much water is used and how soon it is used. I keep my setting on a very fine mist. With this setting, I have gotten 5-6 days of 12 hours per day out of one tank of water. This is a long time for one tank of water. I am taking the "100-Hour" description to be the maximum for the unit. The opening that the mist comes out of can be turned 360 degrees. It also has a second opening that can be turned completely around also. This is where the multi direction of the misting comes in. Another nice feature of this unit, it has a soft blue night light. This can be turned on or off through a separate control button on the front also. The only thing I can say that is negative about this humidifier is the controls on the front. They feel kind of loose and like they do not make good contact. I have to turn the on button a couple of times and jiggle it to get it to come on. May be only on this unit only. I have a home with a forced air heater and the air often gets dry, this humidifier does the trick. There was not much packaging to dig through in the box and setting up the humidifier was very straight forward. The low profile of the device allows me to fill up the humidifier very quickly without a hassle. I also really like how the humidifier looks on our dresser. Pros: The humidifier looks great and has an option for warm or cold air. In addition, there's a night light that helps keep the room lit at night. The humidifier is relatively silent and you can swivel the outlet head in any direction you chose to get as much coverage as you desire. There's no need to buy any filters for the humidifier, and it also comes with a little brush to wash around the base. I used to use a humidifier that had a rotating spinning disc that propelled air out and this is so much better and sleeker. Cons: I really have nothing bad to say about this humidifier. It does its job well, has some great features and the fact that it lasts 100 hours is truly fantastic. The humidifier arrived in a plain brown cardboard box with the box for the humidifier inside. Great packing job. As far as the unpacking and first setup is concerned, it was easily achieved without use of the owner's manual. Even though the owner's manual was included. Adjustments and operation of the machine were self-explanatory. The control knobs appear to be of good quality. I.e., it was actually metal that made up the outside knobs, not plastic. As far as the water container goes, I have never seen a humidifier [and I've been through three] that accommodates the way the water container is mounted half and half on top of the machine, allowing for easy cleanup and maintenance. The brush that was included with the reservoir is easy to use. The water reservoir is easily filled when placed in the sink. The top isn't quite flat but doesn't tip over when you are filling it. It comes with a blue light that shines through the water. We find it quite pleasant and works well as a night light. Compared to the other three humidifiers we have used this one is the best. The others were moldy over time. This humidifier when on high seems to last between 12 and 14 hours. The only problem I have found so far is that the carrying handle on the water reservoir is of a poor design and instead of carrying the container with one hand, using the handle, you have to more or less carry it like a baby. Overall, we cannot determine whether mold will become a problem with this machine until later, Since we have only been using it about two weeks. Otherwise, the cord to the machine is not removable and is only about 4 feet long. Overall, I gave this product 4 1/2 stars because it produces a very cool calm atmosphere while operating in near silence and a continuous mist that comes out the top of the machine in an nice size stream, cooling and moisturizing the air..
Can i add essential oils to water? 1. We do not recommend the use of essential oils or additives will void any warranty and could potentially cause the plastic to break down and cause the unit to leak. How do you take it apart to fill it? 1. You remove the blue water tank and flip it over. Twist off the lid and fill that open area with water. How much electric does this unit take? 1. It will use 30W on cool mist and 1120W on warm mist.